What do you call an ant that won’t go away? PermanANT! Who do you call when ants won’t go away? Eco Tech! Serving all of the Mounds View, MN area, we provide eco and family friendly extermination services. Ants can sometimes be considered the worst pests of all time. Mainly, because when one invades your home, millions can follow! At Eco Tech, our professional ant exterminators are here to help you with your pest control problem and make your house ant-free again! If even the tiniest crack or hole is present, an ant can find it and makes its way into your home or business! They can be found anywhere around your home or business. The lawn, walls, stumps, and even under the foundation can be the perfect spot for ants to create their nests. Once a nest is built, colonies can grow to be anywhere from 300,000 to 500,000 in numbers…gross! This is one of the many reasons why it is incredibly difficult to get rid of ants on your own. When you have a pest control problem, calling in professional ant exterminators is the only correct option! Providing eco and family friendly extermination services, our professional ant exterminators are experts when it comes to getting rid of your ant problems! We have the innate ability to locate the nest location and eliminate all of the ants in your home at once. Our professional ant exterminators have over 15 years of pest control experience and understand what it takes to successfully complete the job. Professional ant exterminators are able to tell the difference between ant species, and therefore, can properly treat each species with their own eco and family friendly extermination services. This means that we can terminate your ant colony all while using a less toxic organic product line that works every time! We receive the phone call and work out a flexible time to meet! 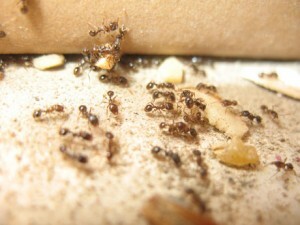 Our professional ant exterminators inspect the area and find the problem. An Eco Tech member will come out and exterminate the ants! Yahoo! We can repair any damage to the areas that the ants may have caused. We then can prevent the pests from coming back! We are so confident in our services that we offer a four-year warranty on all of our services. If you live in Mounds View, MN and have an ant problem, it’s time to call Eco Tech today! Call us at 763.785.1414!